Professional Darts Corporation chairman Barry Hearn says "the fans deserve" top level darts to be played in Cardiff. 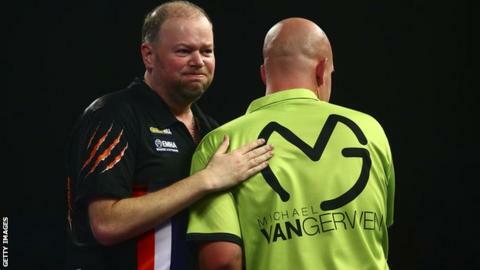 The first Champions League of Darts, featuring the world's top eight players, will be shown live across the BBC and staged at Cardiff's Motorpoint Arena between September 24-25. "Darts is a huge deal in Wales and this was like the general election results for us," Hearn told BBC Wales Sport. "We picked Cardiff because it is the fastest-selling venue we had." He added: "We have 16 Premier League darts venue and always have a little race to see who sells out first. "Cardiff has consistently won that race over the last three years, so we know there is the demand there. "So two days, with the best eight players in the world, that's our way of saying thank you to Cardiff." Hearn believes the event being on the BBC is a boost for the sport and his organisation. "Being on the BBC is big news and another statement of how far the PDC has come," he said. "It's good news they can announce a really world-class sporting event for their screens. I'm overjoyed." Barbara Slater, director of BBC Sport, said: "Darts has always had wide appeal and it is great that audiences will get the chance to see all the action from the world's top players live on BBC Two and across our platforms."